The notes on this one are from the site where I got it. I have Pennsylvania Dutch heritage, too. Adjust oven rack to lowest position and heat oven to 325 degrees. Crack eggs in a medium bowl and whisk. Whisk in milk. Add sugar, flour, cinnamon and salt and whisk into milk mixture. Pour filling into unbaked pie shell. Bake until custard has set and crust is golden, about 50 minutes. Remove from oven, cool and serve at room temperature or chilled. It has a fabulously funny name – Bob Andy Pie – and old roots in the midwest Amish communities of Illinois, Indiana, Missouri, but it feels right at home today, when we crave simple, comforting flavors and value the utter ease of a dessert for which you will already have all the ingredients. Some might think of it as a spiced chess pie. 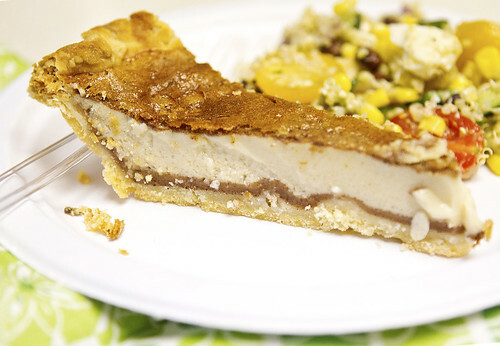 Others liken it to a Sugar Cream Pie, a staple that is popular in Indiana. The common story goes that an Amish farmer came in from working in the fields, took one bite of this delicious pie and said, “This pie is as good as Bob and Andy.” Bob and Andy were his two prize gelding plow horses. That works for me! I guess it speaks to my Pennsylvania Dutch heritage. One intriguing feature of this pie is that the ample cinnamon floats to the top while baking, making a dark crust, and giving the impression of layers. It’s a very pretty pie when cut!